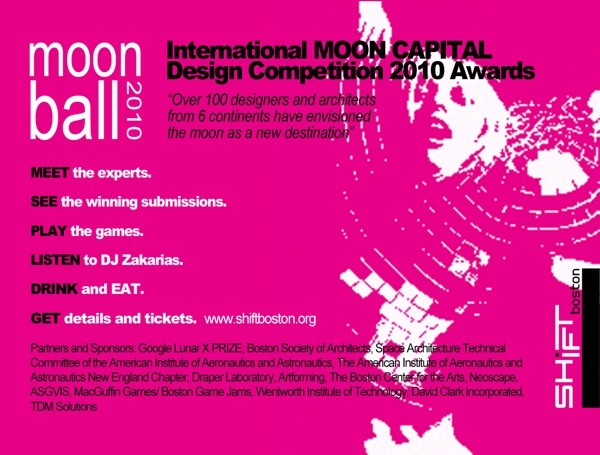 If you’re planning on joining for this weekend’s Boston Game Jam, Lunar Jam, don’t forget to RSVP here. To pique your interest and provide some more background on the thematic motivation of the event, here’s the “cool kids'” poster for the Moon Ball event at the Cyclorama where we’ll have playable versions of one or more of the games we make at the jam. The future of space exploration is the subject of intense debate. Meanwhile, scientific expeditions and the development of space tourism are pushing us to reconsider our relationship with our own planet here on Earth. With this in mind, the architects and designers in this competition saw the moon as a rich context for experimentation to explore new concepts for life on earth. Over one hundred new visions from six continents and twenty-six countries have been received. We invite you to come to see a presentation of the most outstanding selections. So, at Lunar Jam we’ll be making games based upon the Moon Capital Competition challenge’s finalists, grand winner, and other entries to show how we can use games to imagine a possible future of life on the moon. So come join us! Previous post: RSVP is open for Lunar Jam!